Mayor Megan Barry touted the pilot project for improving pedestrian safety. Currently the sidewalk is about 12 feet and will expand to about 20 feet, Public Works spokeswoman Kelly Brockman said. The loading zone for musicians to drop off instruments and trucks to make deliveries will still be there, she said. The initial estimate is that the project will cost between $250,000 and $300,000. “This is a pilot to see if it will help and work,” Brockman said. As the city pondered design possibilities, it kept the honky-tonk owners in the loop. An initial design idea called for seating area for bar patrons. But honky-tonk owners balked at that idea, fearing it could attract panhandlers. In a letter to Barry’s administration, a group of owners said there is already plenty of seating on lower Broadway. Public Works Assistant Director Jeff Hammond said the project won’t impact the existing sidewalk. “We’re going to be cutting the curb off and start building directly adjacent to that in a contrasting brick pattern,” Hammond said, adding that the seating concept was scrapped after the feedback from business owners. The large bollards could still be moved for special events like CMA Fest and July 4 fireworks. 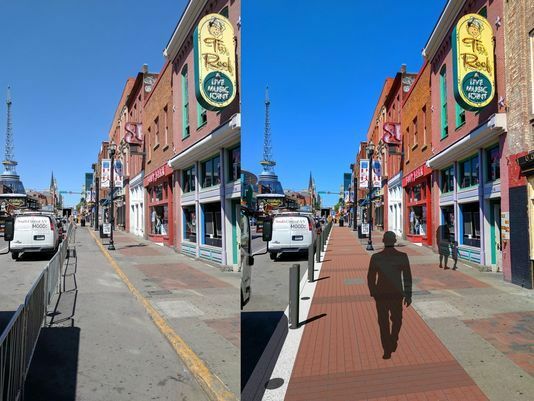 If the pilot is well received, the concept could be expanded to other parts of lower Broadway. The bollards will replace the bike rack fencing that has been on Broadway for about two years. As part of the pilot, Hammond said the department will test a variety of possible materials connecting the bollard posts.